It was an eventful shopping trip. But then they’re always memorable with three-year-old Benedict. Leaving my wife Lyndsey and baby Patrick on the ground floor, I persuaded him to come down with me to the men’s department in the basement of Binns department store by threatening to take his bananas off him if he didn’t. They weren’t the kind of bananas that grow on trees, of course – he’d have handed them over happily. This was a coveted bag of sugar-rush inducing sweetie bananas. Down the staircase we went. I enjoyed the amused smile of a shop assistant as I hoisted Benedict up by the waistband of his ill-fitting skinny jeans to conceal his Bob The Builder’s-bum. I momentarily switched off as I combed through a display of scarves looking for something stylish to complete my business look. Then I made my regular glance back to where Benedict had been following moments earlier. “Benedict?” I asked hopefully, and then repeated it quickly and a little more urgently as it dawned that I was alone. An eternity of split-seconds passed as I prowled between the immediate rails of clothing, scanning frantically up and down in the hope of seeing him. I called his name again, this time louder, then immediately echoed it louder again. His absence felt complete. He’d gone. As the catastrophising started, I was overtaken by the alarming physical affects of my mental distress. My body was inhabited by melted muscles. “Benedict!” Not wanting to move away from the small zone I thought he must be in I shouted, spinning on my axis, alarmed by his loss and the way the terror draining was my own ability to do anything about it. What if he wasn’t close by? What if someone was taking him away as I wasted time looking close by for him? What if I’d lost him forever? Then, 50 feet away, I saw the assistant who’d been watching us earlier raise her arm and point to back the foot of the staircase where we’d entered the department. I swept across the shop and saw him, and he happily muttered something mundane that I can’t recall anymore. “Benedict, I lost you,” I said. “No you didn’t, Daddy,” he replied calmly, blissfully unaware of any problem. Once the family regrouped, we headed back to Sainsbury’s. I left Lyndsey with the boys and rushed round, picking up milk, bread and yoghurt. When I returned, expecting us to head straight for the checkout, it was clear that it wasn’t going to be that straightforward. Benedict was holding an Elsa tiara and jewellery set. Lyndsey glared in my direction. “We haven’t got any pennies – have we, Daddy?” Benedict was genuinely distraught. “Have you got some pennies, Daddy?” he implored. He was tearful but determined and it was difficult to foresee a peaceful conclusion to the impasse. The reaction from our fellow shoppers was mixed; some amusement, some disbelief and some disdain. Then Benedict stepped up his campaign a couple of gears. He wasn’t going down without a hell of a fight. 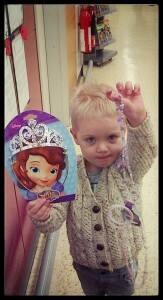 “I want to be a princess!” he demanded. “Why can’t I be a princess?” His commitment to his cause was nothing less than admirable. After a five-minute standoff I quietly asked Lyndsey asked how much his little haul would cost us, and from that point on the eventual outcome was probably inevitable. Our next stop was Barker and Stonehouse to look at sofas. Harmony restored, our family group walked through the shop. Benedict was wearing a tiara, with plastic pearls draped round his neck and bangles and rings adorning his wrists and hands. A salesman couldn’t hide his amusement as we passed him by. Benedict wrinkled his nose and nodded up at the stranger. “I had a little meltdown in Sainsbury’s,” he volunteered.